Ecco my list of Rome picks. It is not exhaustive, nor is it complete or fail safe. 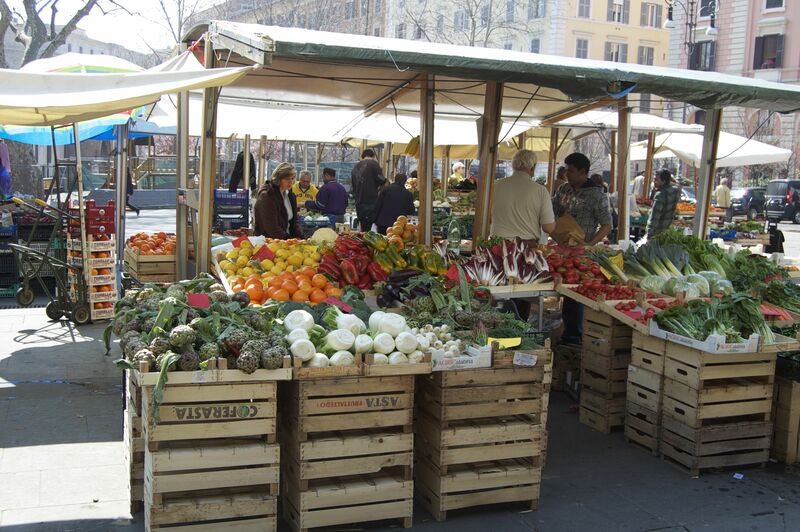 Being the tourist mecca that it is, Rome is not without it’s gastronomic pitfalls. Roman food is essentially very uncomplicated; most dishes rely on two or three ingredients, and everything is carried by the essential seasonal produce. Very Roman: Carciofi (artichokes – winter, spring), Fave (broad beans – spring), Puntarelle (so Roman there is no translation – winter) and Cicchoria (chicory – year round). 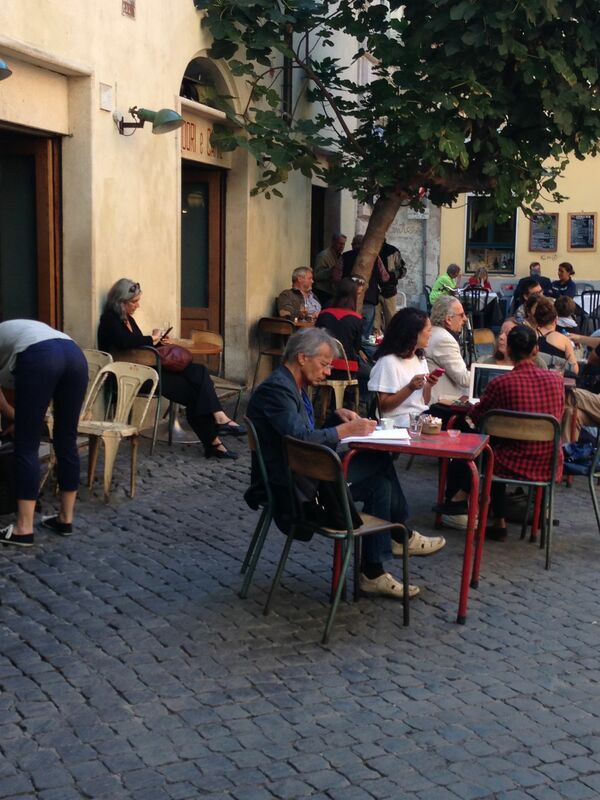 Da Augusto Piazza de’ Renzi, 15, closed for dinner Sat and all Sunday. Come early or late for lunch in this cramped little spot with tables spilling out on to the piazza – there is often a queue. This is real home cooked Roman food, served by cheerfully grumpy Roman girls. Best are the stews: Abacchio alla Romana (lamb), Pollo alla Romana or Alla Cacciatora (chicken), and in winter-spring try the Puntarelle, a side dish of crisp curly greens dressed with anchovies and garlic. This was where Rachel and I had lunch when we had more time on our hands. Da Enzo Via dei Vascellari, 29, tel +39 06 5812 260 info@daenzoal29.com On the quiet side of Trastevere near the Tiber Island. Little osteria that serves simple seasonal Roman fare. Last time I ate there I started with La Gricia – spaghetti with panfried pork cheek and Pecorino tossed through it, sort of an Amatriciana without the tomatoes, which seeing as fave were in season had a handful of Rome’s favourite beans tossed through it. 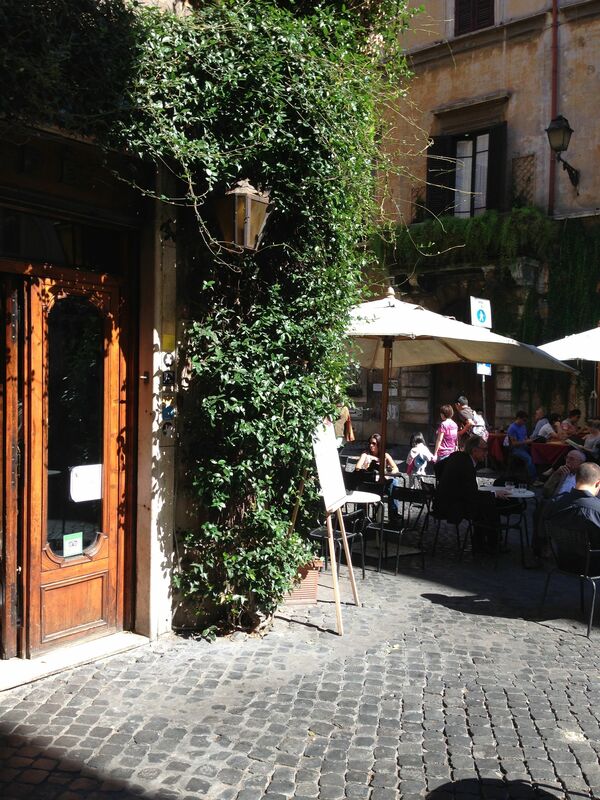 Piazza della Pace, 3/7 tel +39 06 6861216 On the corner of a small square behind Piazza Navona and close to the always worthwhile Gallery Choistro del Bramante, Caffè delle Pace maybe in tourist heartland but is one of the icons in the old European style. Go, and sign the petition to stop it being turned into a 5 star hotel! via Benedetta (the bar not the restaurant) wonderful pistachio gelato, which I team with chocolate, nocciola (hazelnut) and a daub of cream on top. Give the restaurant a miss. Via Marmorata, cnr Via Galvani Parco della Resistenza. A cool little place for a grataceccha (shaved ice) in summer. Ai Marmi AKA Orbitorio (trans. Morgue) for its marble tables Viale Trastevere, 53, across the road from Piazza Sonnino This place is classic, and even though my last experience wasn’t so great. The ageing waiters rushing between the cramped marble tables and the feeling you could be in a roman film from the 60’s that make the experience. There are tables out the front too, but there’s often a queue for these and the space inside is where the real atmosphere is. A textbook Roman pizza dinner is: Birra (not wine), fritti (Bacalà, fried zucchini flowers, supplì) followed by pizza. Bonci via Trionfale, 36 Gabrielle Bonci is Rome’s baker pizza boy of the moment. He looks like Roma star Danielle De Rossi who has eaten too much, well, pizza, and has a warm and effusive personality. He loves his bread, uses only organic flour and has an array of pizza by the slice and little rolled up calzoney looking things on the counter in his Prati store that make it a great lunch on the move / snack option. Piazza della Cancelleria, 74 ph. 06 687 1626 closed Mondays Lovely! Menu from all over Italy rather than just Roman fare. Carefully produced and served in a small warm space. No outside. Best to book. Via dei Genovesi, 37 ph. 06 581 6017 closed Monday. BOOK! This is our old favourite favourite. A cut above your average Trastevere osteria but without being formal and stuffy. Pasta is home made and they will also do half serves if you want a little primo. Excellent steaks and good fish. Best are the desserts, all made in house – a rarity in Rome. Roman Jewish food deserves a post all to itself, but here I will limit myself to saying – watch out for the tourist traps of the Ghetto serving middle eastern jewish food – and stick to those serving Roman Jewish fare like Carciofi alla Giudia – fried artichokes.